Von Neumann was born in Budapest, Hungary, on December 28,1903. While in school his mathematical talent was recognized early and he was tutored privately. He received his Ph.D. in mathematics from the University of Budapest in 1926. He developed his reputation by publishing a series of papers on set theory, game theory; logic, and quantum mechanics. He came to Princeton University as a visiting lecturer in 1930 and three years later became one of the original professors at Princeton’s Institute for Advanced Study. He developed what are now called “Von Neumann algebras,” providing new principles of mechanics needed to explain the behavior of subatomic particles. He proposed axioms to which quantum theories would comply if space were expanded from three dimensions to an infinity of dimensions. Eventually, in 1955, he was able to prove the equivalence of the two leading models of quantum theory: wave mechanics and matrix mechanics. In 1943 von Neumann joined the Manhattan Project in Los Alamos, New Mexico, helping to develop the atomic bombs dropped on Japan that ended World War II. He applied prior work on detonation waves to the investigation of implosions, solving difficult equations using Harvard Computational Lab’s Mark I, considered the first full­scale programmable computer in the United States. Soon after von Neumann became interested in the much faster ENIAC, an electronic computer, being developed at the University of Pennsylvania. A person of wide­ranging interests, von Neumann published many papers on game theory, beginning in 1926. Assuming rational choices, he invented mathematical strategies for winning and for analyzing social dynamics in competitive situations. His “Model of General Economic Equilibrium” (1937) became a foundation of modern economic theory in which game theory is applied. Collaborating with Oskar Morganstern led to a seminal book, Theory of Games and Economic Behavior, published in 1944. By this time, however, computers became both his tool and his obsession. The ENIAC group was already planning its next computer, the EDVAC. 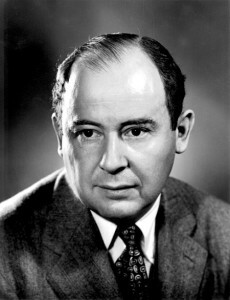 Von Neumann joined them as leader of the team planning the computers architecture, or logical organization, while others worked on technical problems. He wrote the influential “First Draft of a Report on the EDVAC” in 1945 advocating more reliable, faster computers. He proposed computer designs including both an arithmetical component for elementary operations and a central control organ for logical flow of information. After World War II von Neumann continued to consult with the military and the Atomic Energy Commission at Los Alamos. He was very involved in development of thermonuclear (hydrogen) weapons and their long ­range delivery systems. He opposed disarmament and favored stockpiling weapons as a defense strategy. After a decade of service on its General Advising Council, von Neumann was named Atomic Energy Commissioner in 1955. He died of bone cancer in Washington, D.C., on February 8, 1957. Von Neumann developed the mechanics, foundations of quantum mechanics, proposed an influential theory of games, and developed the logical framework for rapid, reliable digital computers. Von Neumann’s ideas for organizing and programming computers by using specific ordered sequences of instructions are still in use today. Although modern microelectronics have allowed the hardware to shrink, the basic architecture of computers is inherited from von Neumann’s ideas on reliability and error theory proposed more than a half century ago. Von Neumann’s work on quantum theory influenced theoretical physicists and, in general, established that traditional causality (which ALBERT EINSTEIN favored) and WERNER HEISENBERG’s Uncertainty Principle could not be reconciled. The Uncertainty Principle states that an exact measurement of both the speed and position of a subatomic object is impossible given the disturbance that is caused by experimental conditions. The theory remains at the forefront of contemporary subatomic physics. Game theory has flourished because it permits analysis of coalition formation and profitability, describing tactics beneficial in long sequences of moves. Its rigorous mathematical approach has been applied not just to games like chess and bridge but also to military strategies, business cycles, and studies of social organizations. Although von Neumann’s ideas were published in the 1930s and 1940s, they were not adopted until computers were available to perform the complex mathematics involved.